If you are interested in ordering magnets or stickers, please complete our Online Form. You must be a resident of North Dakota to order materials. 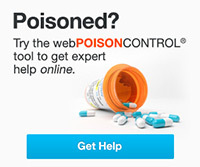 You have permission to reprint and/or reformat information sheets, articles or other content from this website as long as the number 1-800-222-1222 is prominently displayed and the Poison Help logo, if used, remains unaltered. The following materials are available for download in PDF format. If you don’t have Adobe Acrobat Reader, you may click on the icon for a free download. Poison prevention brochures written in various languages are available below and can be used to prevent exposures to hazardous substances, promote awareness of poison prevention, and increase utilization of poison control services. If you are interested in ordering free magnets for Spanish speakers, please contact PoisonHelp@hcmed.org.